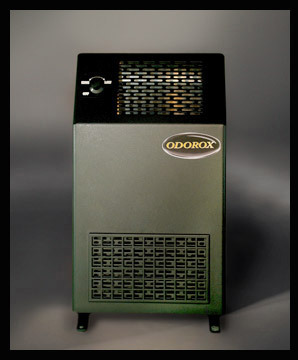 The Odorox® SanX unit is perfect for small commercial spaces or residential use up to 750 sq. ft. (75 sq.m.) assuming a ceiling of 9ft/3m and is ideal for eliminating bacteria, viruses, moulds, odours and chemical off-gassing typically found in public spaces within enclosed buildings such as long term care facilities, commercial offices/cubicles, and residential homes or apartments. Because of its compact size and light weight, the SanX™ unit is easily portable within these types of facilities as well as being floor or wall mountable. It is equipped with a variable speed fan control and a washable filtration system. The variable speed built-in fan is adjustable from approximately 100 to 210 cfm and operates using only 0.8 Amps. Odorox®, SanX™ and HGI Industries Inc. are either registered trademarks or trademarks of HGI Industries Inc. of Boynton Beach, Florida USA. Other trademarks are pending in the U.S. and other countries.